I previously visited the Safety Harbor Resort for a girls getaway in 2015. When I made a return visit to the area with my husband recently I was excited to share this historic resort in all its polished beauty and its bay front setting. When I arrived I had concerns the reservation I made with my cell phone did not reflect my preferences. Our wonderful check in agent Chris made sure everything was exactly as we would like. All with patience and a positive attitude. Thank you for that. He and Rebecca at the front desk were very helpful.The bay view accommodations are beautiful and the view is breathtaking. The onsite restaurant is lovely and affordable, Ronnie took great care of us at breakfast each morning. 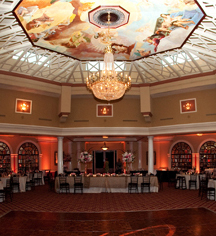 My husband is a history buff and enjoyed the many photos in the lobby area and great room showing how this resort on the magical mineral springs came to be, and it is an important part of the history of the community. Speaking of the mineral springs, the mineral water is still an important part of this resorts amenities . Guests drink this water in the spa area and from water heaters/coolers on the floors of the rooms, as well as swimming in the water (in the pools). The water is said to have healing powers. I know I leave there with a refreshed feeling inside and out. If you have time take a walk along the bay, and walk across the street into the small town. Stayed there last Saturday and must say I was impressed. Annabella at the front desk was awesome; she was friendly and accommodating to an error on my part. The room was very nice and comfortable. The resort appeared to be recently renovated. Perfect location to restaurants and stores within walking distance. The amenities were abundant; this is where you can actually enjoy what a resort fee offers to paying customers. Will definitely return but will book directly with hotel and not thru any broker website. Well done SHR&S! Sunday, during spa hotel open hours, I called to find out about spa services to make appointments for my stay. I only had one day I could go to the spa, and was the reason I chose this hotel and was hoping to schedule in the morning because I had evening plans. I called Sunday and the hotel operator sent me to the spa phone which went to the voicemail. I called again, same result. I called a third time this time saying it was my third time calling and did anyone at the hotel have any info about spa services and was told no - call back tomorrow. Monday, during spa open hours I tried to call the spa again to book for Thursday morning. Again my call went to voice mail, this time I left a message and followed up with an email. I got a response to the email just at closing saying sorry the services are not listed on line we will call you tomorrow. They never called. I called Tuesday and someone actually answered in the spa! They reiterated there was no services listed on line and just transferred me to registration where someone finally read me the services, but of course, Thursday morning was no longer available, I had to rearrange my schedule and settle for Thursday late afternoon. Why couldn't the services have been read to me on Sunday during my first call vs my fifth! I requested the Palms building, when I booked months ago, but when I finally spoke to someone on Tuesday I was told only the towers were available, sigh... at least she put me on the top floor - nice view of the Tampa Bay! At check in I was informed the phone system was down and would have to call the front desk from my cell throughout my stay to get any staff which is a long distance call for me. When I arrived at 7pm only one person was working the desk when they really needed two. The next morning I called for room service, they were so understaffed from someone calling in sick it crippled them, they had to apologize and say we cannot do room service this morning can you just come down and serve yourself from the buffet. I went down to the restaurant, served myself from the buffet as suggested. They were doing their best but were in way over their heads. They had barely any servers. All I heard was people complaining. The eggs were completely dried out and the waffle was terribly hard. The Spa was nice. Massage and facial therapists were great! However, the desk staff was a bit harried. I tried ordering room service again that night - they did deliver! But the dessert I ordered said chocolate cake in the description yet had no chocolate cake in it. I called, they quickly brought me another chocolate dessert and admitted the menu needed updating. In summary most of the staff tried hard to make my stay nice. But the hotel is woefully understaffed. The hotel needs to get a LOT of things updated, phones working, accurate menus, spa services listed on the web site - before I would come back. Its sad because from what I've learned this used to be a quality place. Fabulous stay in a fantastic town! FIVE STARS!!! 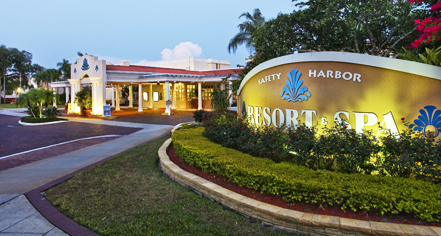 We participated in an Interval International exchange and swapped our timeshare for a week's stay at Safety Harbor Resort and Spa, located in Safety Harbor, FL. We paid a very reasonable price for the all-inclusive fee. This fee covered all of our meals, beverages, including: sodas, wine, beer and well pours. The fee also covered 2 spa services for each of us - a total of 4 spa services. We were also guaranteed a room with a view. What a deal! So, how was our stay? Excellent! As for food, our all-inclusion covered every meal (breakfast, lunch & dinner) as well as EVERY MENU ITEM available from the onsite restaurant as well as the pool's tiki-bar. Meals were served fresh and with a smile. The menu offered plenty of options to provide a wide variety for a week's stay. Service was always on-point. Our spa experiences were also excellent. Both my husband and I received a Swedish massage and a facial. So relaxing! Our room was quiet, comfortable and provided for a beautiful ocean view. We also appreciated the outdoor balcony. Don't mess with the bottled waters for your room. Each floor has a complimentary source of chilled mineral water - and every room has a carafe. We found this to be very handy! We also loved the nightlife in the lobby bar. Nearly every night had live musicians with various themes: blues, jazz, standards. Dancing, drinks and fun - had by all! Glad we did not rent a car! We Uber'ed / Lyfted to and from Tampa Airport. No car needed unless you plan on exploring Orlando or other further cities. There are plenty of great towns / beaches that are easily accessible with Uber and Lyft that are near Safety, Harbor. Safety Harbor, FL - never heard of it? Neither had we. Safety Harbor is a charming town, extremely walkable with plenty of boutiques, pubs and restaurants - many venues that will meet the demands of any choosey foodie. Best part - the resort is literally steps away from downtown Safety Harbor. No tiring walks across a massive resort property, no need to wait for the courtesy shuttle. Walk out the front door and across the street and you're in downtown Safety Harbor. My husband and I are already planning our return to this resort. We highly recommend that you swap your timeshare and stay here for a week. You'll be glad that you did. Happy Travels! We stayed at Safety Harbor two years ago and returned again this year. The hotel was previously an Ascend hotel, part of the Choice hotels. It is now under new ownership and they are in the process of making many changes. The rugs in the hallways need to be replaced and there was a poster near the front desk indicating that rug replacement was in their plans. Our room was fine - clean and spacious. We didn't use the spa. We did go to the tiki pool bar and the piano bar which were both lots of fun but the price of cocktails was outrageous. The location of the hotel is perfect.